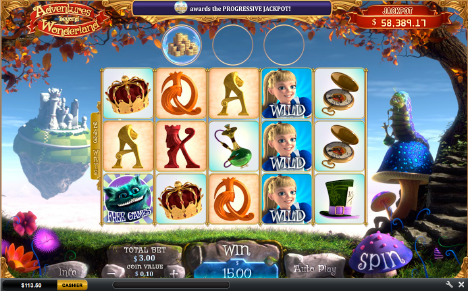 Fly Casino is thrilled to bring you Adventures Beyond Wonderland, a 5 reel, 243 ways to win progressive jackpot slot. New to Fly Casino, this new hot slot has an Alice in Wonderland theme and provides you with 3 bonus rounds as well as a massive progressive to win. During “base game” spins, there is an active bonus feature working to improve your. It’s Alice randomly falls from the trees above onto the reels which triggers the Falling Alice feature. Alice can only fall on reels 3, 4 or 5 and when she does, she will pop Bonus Bubbles in addition to making that reel all wilds. A Caterpillar to the right of the reels will blow a Bonus Bubble on any spin as you play. Inside the Bonus Bubbles are several bonuses awards and features that occur when Alice falls from the trees above. The Drink Me Potion which makes Alice grow and create an extra 1 or 2 reels filled with wilds. These will give you up to 7 reels which unlocks 2,187 ways to win. Cheshire Cat Free Games rewards you with a random number of free spins which are played on up to SEVEN reels with 2,187 ways to win. Adventures beyond Wonderland is great to play! The game does reward you over and over and makes your time on the game last longer and more enjoyable. YOU MUST TRY IT THIS WEEKEND! 115% Big Money Tuesday! From 00:00GMT until 23:59 GMT, all members are invited to receive a 115% bonus up to $/£/€320.00 on your deposit of just $/£/€50 or more or more.